Sailors have to consider space and weight when stocking their boats with workout gear. Heavy dumbbells and bulky fitness equipment are out of the question, so Legum suggests using an elastic Thera-band instead. “[It’s] my favorite piece of equipment due to its size, cost and usefulness,” Legum says. Thera-bands (thera-band.com) come in various tension levels and can be used virtually anywhere on the boat for a full-body workout. Start with a medium-resistance band and move up to more challenging ones as your strength improves. The majority of these exercises can be modified for use both above and belowdecks. Complete this routine once a day, performing three sets of 12-15 repetitions on both your right and left sides. 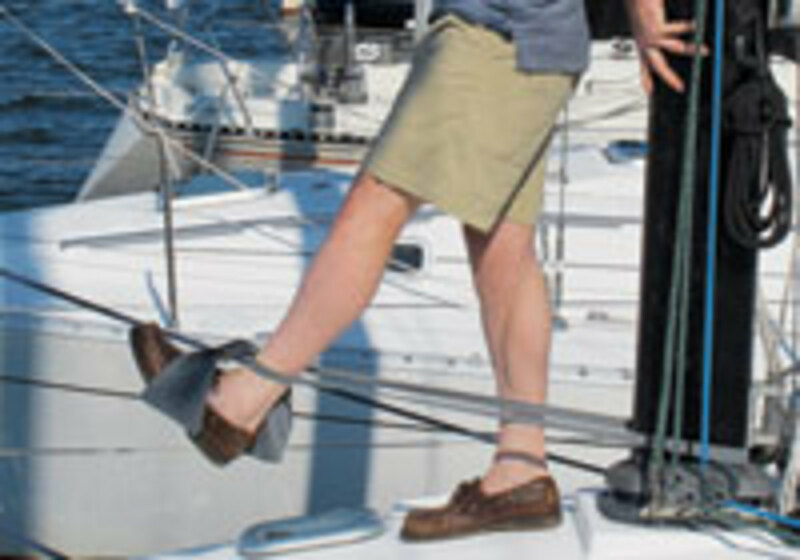 1) Front Raise: Stand on the foredeck and face forward, tie a loop in the elastic and step through it with your right foot. Hold the free end in your right hand, begin with your arm straight at your side and raise it to chest level. Maintaining resistance, slowly return to the start position; switch hands. 2) Bicep Curls: At the mast, secure one end of the elastic at deck level and wrap the other end around your right hand, facing starboard with legs shoulder-width apart. Start with your right arm at your side. Slowly bend your elbow and raise your arm to a 45 degree angle, then slowly return to the start position; switch hands, turn to port and repeat. Works shoulder, triceps and core. 3) Hip Flexion and Extension: Loop the elastic around the base of the mast and tie the ends together around your left ankle. 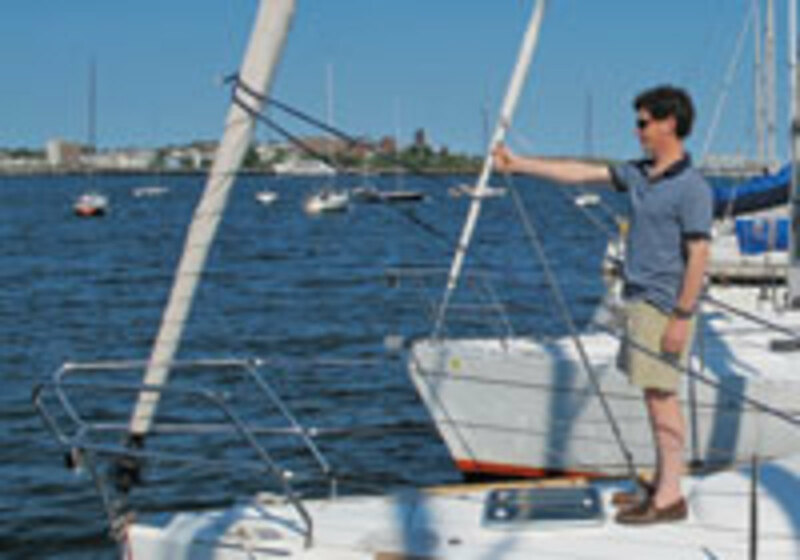 Face forward, place a hand on the mast for support, extend your straight leg forward 30 degrees and then slowly return to start position; switch legs, then turn to face aft and repeat the exercise, extending your legs behind you. Works hip flexors, strengthens quadriceps. 4) Shoulder Extension: Secure the elastic to the mast with a loop, stand facing aft, hold the free end of the elastic at waist level and then extend your arm straight back, keeping the elbow straight. Return to start position; switch hands. Works shoulders and strengthens core. 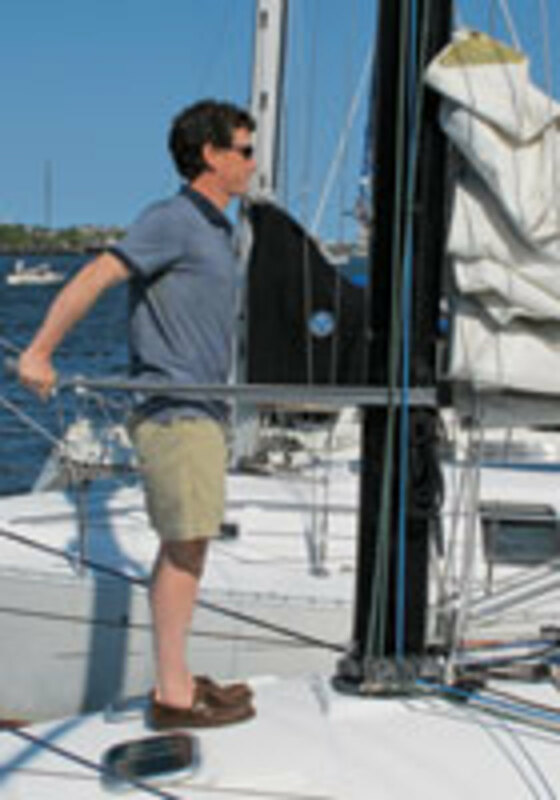 5) Chest press: Belowdecks, secure the middle of the elastic through a shoulder-height opening in the companionway handrail. Face forward, stand in a lunge pose and start with your elbows bent and hands in fists at shoulder level, pressing straight forward until your elbows are nearly straight. Slowly return to the start position. 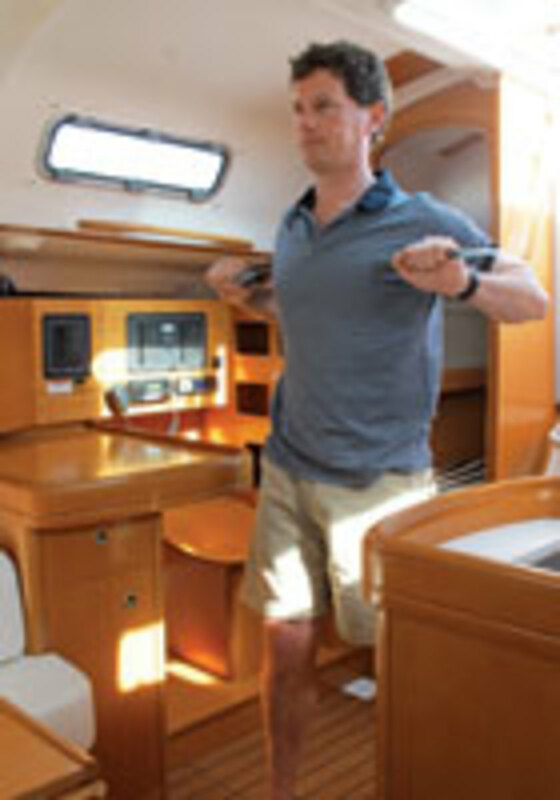 6) Tricep Pushdown: Belowdecks, stand facing companionway and secure the elastic as with chest press. Hold the two ends of the elastic in each hand with your elbows bent 90 degrees and your arms snug against your torso. Push your hands down until your arms are almost straight, keeping your elbows close to your torso. Return the arms to the 90 degree starting position.